Four students from the Harrison High School agricultural program worked with LYH staff to prepare and show our Red Angus heifer in competition at the 2015 Royal Canberra Show. They were awarded 3rd in class (photo shows Arnyha and Zavier with Witzels Diamond). 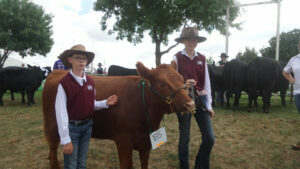 The students also competed at the Yass show where they were 2nd in class. The program was highly successful with good parental support and is likely to continue.